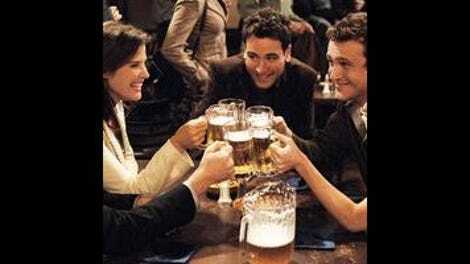 We’ve had a good long run of weekly episodes in this last season of How I Met Your Mother. They haven’t all been gems, but most have been solid, and a few have been truly lovely. But now we’ve reached the point in the season when the network scheduling suits start doling out “all new” episodes more stingily. The show was off last week, and now it’s off again until mid-January. All we get in the meantime… is this. You may be gathering that I didn’t find “this” very impressive. (And I’m an easy mark, as you all know.) For a half hour that not only gets Marshall back into the ensemble but also gives us the most Mother we’ve had yet, “Bass Player Wanted” turns out to be a disappointment. Some of the problems are internal to the episode, but at least one is due to the way the season has been laid out. This would have played a lot better if we were coming off of the beautifully structured “Rehearsal Dinner” last week and looking forward to the hotly anticipated “Slapsgiving 3: Slappointment in Slapmarra” next week. Instead the dip feels a lot deeper, because of the week off before and the weeks off after. And although I’d prefer not to dwell on the pacing of the season as opposed to the quality of the episodes individually, the former can’t really be avoided, because the season-long gimmick puts it front and center. Let’s get to the reasons why “Bass Player” turns out to be a sour note. As much as I love seeing Andrew Rannells (Book of Mormon, Girls) on my television screen, I think his performance throws off the energy equation of the ensemble. He’s a lot to handle in a small space, and the script makes Darrin the active player in all of his interactions. As The Mother explains it, he’s a member of her band whose “firestarter” talent is to set friends and allies at each other’s throats by sussing out their weaknesses, throwing conversational bombs, then fleeing the scene. (The Mother used to be the lead singer, but now the only time she gets to the mic is during Darrin’s first false exit when she says, “Do you guys want more Darrin?”). 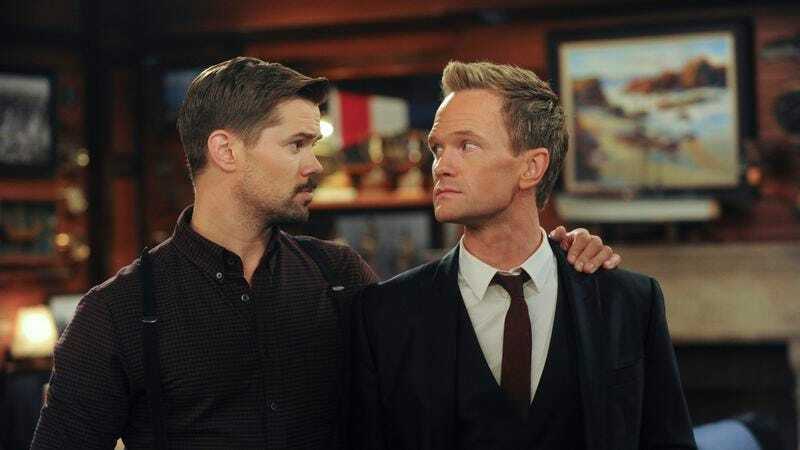 First Lily and Robin, then Ted and Barney, are reduced to reacting to Darrin’s drive-by provocations, and for all of them, this isn’t their most delightful or engaging role. The other problem with Darrin is that his pyromania emphasizes his essential function as a delivery system for plot-driving contrivance. Lily’s anger at Marshall, Ted’s secret move to Chicago—these are big honking conflicts that pit the gang against each other. Darrin’s role is to get them out in the open—not so they can be resolved really, but so we can have enough reconciliation to move on to Sunday morning. It’s telling how quickly Robin manages to get Lily’s forgiveness by claiming her siding with Marshall was based in selfishness, a quick kiss-and-make-up that doesn’t help Lily deal with her anger, but simply pledges to validate it. I’m more touched by the gesture that Ted makes by stealing a third bottle of 30-year-old Glen McKenna scotch, with its callback to Barney’s claim that going to jail for your best friend is “the dream.” But despite being more gracefully structured, their moment of forgiveness similarly leaves all the issues still as tangled as they were before Darrin revealed them. From a season-long perspective, of course, it makes no sense to start resolving the conflicts now, when they still have to percolate into some sort of wedding disaster during March sweeps. But bringing them up only to bury them again rips away too much of the proscenium arch and reveals too much of the sitcom rigging of both this episode and the season—the ropes and gears and pulleys whose job it is to put things back the way they were by the end of the half hour. And what of The Mother? In a perfect world, I would have been excited to see her getting a plot of her own, taking action to get her band back. From a cynical perspective, it’s fitting that Darrin plops that in her lap without her having to do anything. But with The Mother, friends, we’re playing a much longer game. She doesn’t just have her problem resolved by the universe. She has it resolved by Ted. That’s nicely done, even if it does further delay her emergence as a full-fledged character. Maybe the way she cuts through the ongoing $600-bottle-of-scotch drama (by simply asking Linus for the Farhampton Inn’s finest) presages a her upcoming participation in untying a few more of the gang’s Gordian knots. Probably in better episodes than this one. Almost certainly. The bigger and higher-definition our televisions get, the creepier extreme close-ups of actors’ faces that fill the entire enormous screen are going to be. “Bass Player Wanted” uses those close-ups as a trope while the characters’ internal monologues become telepathic internal dialogues, or at least that’s what I surmise they were doing since I was cringing away from the giant heads and missed most of it. Other things that Barney has claimed are “the dream”: a suit made of prosciutto (“so you can eat your way naked”), a pack of lions fighting a tyrannosaurus, being able to take a whole year’s worth of dumps in a 24-hour period so you don’t have to take a dump for the rest of the year. The Mother’s band, Superfreakonomics, formed in business school. Which makes sense because she was in the economics class that Ted accidentally started teaching on his first day when he was in the wrong room. Also, she’s wearing driving gloves. Adorable.